This Revelation Timeline Decoded Bible study focuses on the 6th bowl of Revelation 16. The dragon is Satan; who has empowered the antichrist beast, the Popes of Rome; who are now controlled by the Jesuit General, the False Prophet. As proceeding from the “mouths” of these three powers the “unclean spirits” are instruments of speech. They are “spirits” not material forms; spirits inspiring multitudinous tongues; they are “unclean spirits,” false, ungodly, immoral; they are “frog like,” noisy, loquacious, unceasing in their vociferations; low in character while lofty in pretensions; drowning with their hoarse croakings the sound of noble and more harmonious voices, and wearying the ear with persistent clamor. The three unclean spirits are “the spirits of devils,” which work in some sense “miracles” or wonders, to gather the world unto the NWO. The battle of that great day of God Almighty will happen when the Jesuits have pushed the world into their One World Government, which will push aside all religions and make Messiah and His Church the enemy. So the three unclean spirits are something that causes the world to be pushed into their One World Government. They fit the time frame, as WW I started in 1914 A.D., just as the Ottoman Empire had dried up. As a river is dried up, the frogs issue from its bed and banks, and fill the air with their croakings. As the Ottoman Empire dried up, the Muslim countries, the kings of the East, came to power; and they continually talk about war with Israel and America. They have significantly shifted the balance of power in the world, and allowed the Jesuits to take over large countries, such as Germany, Russia, etc. When Muslim countries attack Israel in WW III, the world will cry out for peace, and a One World Government, to stop religious wars. The Jesuits of Rome have manipulated the kings of the earth, to engage them in the first two World Wars. We can see WW III on the horizon, as Iran seeks nuclear weapons to destroy Israel. To see this fulfillment, we will look at the vision of Satanic Freemason Albert Pike. That seem odd, but to know the plans of the enemy, one has to be aware of what the enemies leaders are proclaiming. Albert Pike was Brigadier-General in the Confederate Army. In 1869, he was a top leader in the Knights of the Ku Klux Klan. 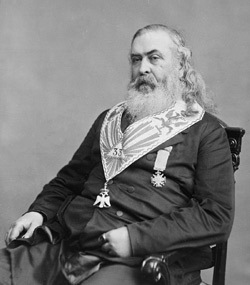 He was one of the founding fathers, and head of the Ancient Accepted Scottish Rite of Freemasonry, being the Grand Commander of North American Freemasonry from 1859 and retained that position until his death in 1891. He is buried 13 blocks away from the U.S. Capital, in the House of the Temple, headquarters of the Southern Jurisdiction of the Scottish Rite. Needless to say he was an evil man who established a framework for bringing about the One World Order. Based on a vision revealed to him, Albert Pike wrote a blueprint of events that would lead to the One World Order. It is this blueprint which we believe unseen leaders are following today, knowingly or not, to engineer the planned Third and Final World War. During World War I, the monarchies of Turkey, Austria-Hungary, Germany, and Russia all met their demise. With one war, the Jesuits helped overthrow these leaders, to take control of these countries. The Jesuits and Popes supported Hitler. Hitler is quoted in saying that he designed his SS after the order of the Jesuits. Albert Pike foretold Political Zionism, before there was Zionism, but it’s been their plan for a long time. WW II helped justify the need for the creation of the Zionist state of Israel, which the Jesuits need for their end times deception, for them to rule from Jerusalem. One of the reasons for WW II was to given the Rothchild’s control of the land of Israel. The Jesuit General, the False Prophet earth beast of Revelation 13, already controls most Muslim countries. The Jesuit-founded CIA controls Al Qaeda and ISIS, to help overthrow leaders like President Assad of Syria, as he has not bowed down to their authority. The Jesuits used deceptive false flags to justify overthrowing these leaders. 9/11 was caused by the Jesuits through the CIA and MOSSAD. Using the supposed “War On Terror” as an excuse, they used the U.S. military to overthrow the leaders of Iraq, Afghanistan and Libya, as they had not bowed down to the authority of the Jesuits. Now those countries have a Jesuit Rothchild central bank and leaders who are ruled by the Jesuits. The Jesuits use sorcery, manipulation and mind control, to control the leaders of most countries, who continually croak out threats of war, to agitate, delude and seduce the minds of men. The leaders of China, North Korea, Russia, Iran, Israel, and America, all voice threats and ultimatums. The Jesuits control all sides and they cause these leaders to play out their narrative, to gather the world into WW III. The narrative is being setup. There will be a ‘religious’ war between Muslim countries and Zionist Israel, and possibly Zionist America. The evil ones control all sides and they will control the outcome. They will cause the world to cry out for a solution, a one world government, to stop religious wars, in the name of peace. And in their One World Order, they will join together the main religions in the name of peace, and they will cause the world to hate the true followers of Messiah, who won’t join with them. And the battle of the great day of God almighty is setup. The White Pope, who is controlled by the Jesuit General Black Pope, is their spokesman. He has said that religious fundamentalism is dangerous. President Obama is also controlled by the Jesuits, and he has said that religious fundamentalists are terrorists. John Wesley Revelation 16:13. Out of the mouth of the dragon, the wild beast, and the false prophet – It seems, the dragon fights chiefly against God; the beast, against Christ; the false prophet, against the Spirit of truth; and that the three unclean spirits which come from them, and exactly resemble them, endeavour to blacken the works of creation, of redemption, and of sanctification. The false prophet – So is the second beast frequently named, after the kingdom of the first is darkened; for he can then no longer prevail by main strength, and so works by lies and deceit. Mahomet was first a false prophet, and afterwards a powerful prince: but this beast was first powerful as a prince; afterwards a false prophet, a teacher of lies. Like frogs – Whose abode is in fens, marshes, and other unclean places. To the kings of the whole world – Both Mahometan and pagan. To gather them – To the assistance of their three principals.